Welcome once again to All-Comic’s Webcomic Spotlight! Today we have Adrien Lee (though most folks just call me Phooka online) from Portland, Oregon. 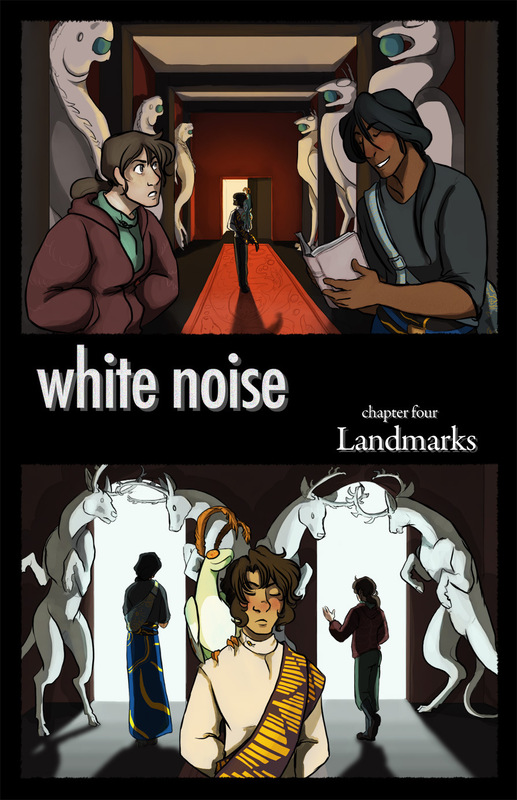 Adrien writes and draws White Noise, a multiverse spanning family drama that includes humans and all types of fantastic beasts! Read on to find out Adrien’s writing and comic making process. All-Comic: Adrien, how did you first get into reading comics? Adrien Lee: I started reading manga–lots of Shonen Jump in my teen years–because I was big into anime and Shonen Jump was affordable on a teenage allowance. I can’t honestly remember how I got from there into webcomics, but it probably happened on Livejournal. AC: What is your favorite comic? AL: Oh man, I’ve got so many! The Less Than Epic Adventures of TJ and Amal holds a special place in my heart, though. AC: What would you say is the most influential story arc you’ve read? AL: Yu Yu Hakusho’s Chapter Black arc, though the whole story in general is about obliterating the idea that good and evil are cut and dry concepts. That blew my mind as a teenager because I’d never read a story that really did that until then. AC: When did you decide you wanted to make comics? AL: When I kept trying to write a novel but was really dissatisfied with not being able to show everything in writing that I’d be able to visually. AC: How long have you been drawing/illustrating? AL: Ever since I was a wee baby. My mom still has a tiny book I made when I was 4 that I dictated to her and then illustrated. AC: Did you study illustration or are you self-taught? AL: I did study animation in school, but considering that I only had two classes that taught (figure and life) drawing, I consider myself self-taught for the most part. AC: Did you get a lot of support from parents and/or (art?) teachers? AL: I think my folks were a little disappointed I wasn’t doing something else with my time, haha. I’ve had good art teachers, but the most supportive of my work was actually my middle school science teacher! He always encouraged me to draw, even when he was lecturing. AC: What was the first comic you remember working on? AL: I entered an OC Tournament on deviantART back in early high school (so 2005/2006 maybe?) but I’m pretty sure that comic’s gone forever! AC: How do you describe White Noise to those just starting to read it? AL: It’s a comic about queer monsters, but it’s not necessarily about queerness. It’s more about queer monsters trying to make it in a world that’s hard to make it in. AC: What inspired you to create this comic? AL: I had these characters I loved and was filling a lot of my free time thinking about them and their stories, and writing a novel wasn’t working out, so I supposed I’d better draw it instead! AC: Why did you start putting up your comic online for free? AL: Partly because I had no notion of what I was doing and how to monetize even if I’d wanted, to be honest. Partly because I started just to make sure I was making art every week and I knew the quality of the art would change massively as I went. 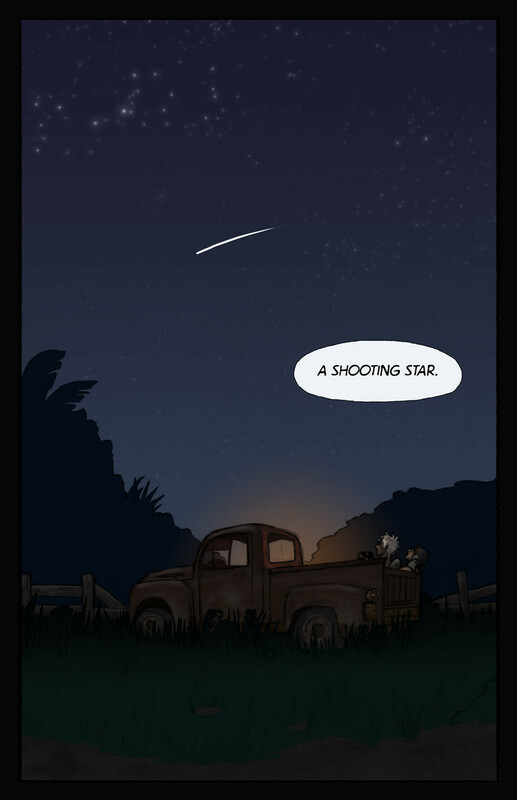 Partly because I hadn’t read a webcomic yet that wasn’t already online for free! AC: What has been the most surprising aspect of running this webcomic? AL: How much research goes into it! I end up Googling a lot of strange things, like whether it’s okay to put peroxide on animal bites and what’s the best way to dress a roadkill deer. AC: Would you ever consider kickstarter or some type of crowd funding to publish this book in a collection? AL: Sure! I don’t think there’s a lot of demand for a printed book at the moment, though, and anyway I’d want to redraw at least chapter one. AC: How do you get these comics drawn out? Physically or digitally? AL: I thumbnail and sketch the page out on paper and then ink and color the whole thing digitally. AC: What are your preferred tools of the trade? AL: A lot of newspaper pads for thumbnailing and sketching, and an Intuos and Photoshop for the rest! AC: How much time does it take to go from a script to a completed strip/page? AL: Anywhere from 8-14 hours, depending on how complicated the backgrounds/perspective is (which I’ll sometimes model out using Google Sketchup) or how hard a time I’m having getting the colors where I want them. AC: Did you set up your own website or pay some one to design it for you? AC: How do you maintain your website? AL: I update my WordPress plugins unless I think it’ll break the layout and I make regular backups, but otherwise I don’t disturb it too much, besides using WordPress’s CMS to upload pages. AC: Do you have any advice for people who want to run a webcomic? AL: Just start! Don’t wait until you’re ‘better.’ Keep a constant update schedule, and be ready to accept that you might write sequences that you can’t quite manage artistically yet! You’ll learn as you go. AC: If you have time, what comics, manga or web comics are you reading? AL: I read too many webcomics to list here, though I just finished a re-read of Inhuman, Paranatural, and Unsounded. I’m also reading a lot of Blacksad and Saga, and I just finally got into Bone. I don’t read a lot of manga much now but I’ll occasionally go on a Yu Yu Hakusho binge. AC: Do you have an all time favorite creator? Be it music, comics or movies. AL: Studio Ghibli! I probably get a lot of love for wide, sweeping, beautiful establishing shots from them. AL: No idea! White Noise will be going on for a long time. There’s so much in this comic’s universe, though, that I’ll probably do more stories featuring parts of the universe that just don’t get shown much in White Noise. AC: How can readers best support you and your work? AL: Spread the word! Tell your comic-loving friends about this new comic they might like. Comment and/or talk to me! I don’t bite and it helps to know if folks are enjoying what they see. I also have a Patreon with some cool perks that readers can back! AC: Thank you for taking the time to talk to us Adrien! Well gang, if you want to check out all of White Noise it’s all up and ready to go. You can reach Adrien on Twitter and support the comic on Patreon if you have the funds available. Webcomic Spotlight: For The Title!